For Google Maps, try copying any cell in the "copy this" column to get directions. Click "directions" to enter two locations. Click + for routing among multiple places. Open to birders with a Jackson Guard pass weekdays from 8am to 5pm. Weekends may not be open. The water basins and their levees are part of the Arbennie Pritchett Water Reclamation Facility, managed by Okaloosa County and leased from Eglin Air Force Base. The surrounding woods and fields are managed by Eglin AFB and can be walked by holders of a Jackson Guard pass. Keep watch for work trucks, and park off the paved road (avoid deep sand), either between the two water basins along Robert Road or south of the first basin (the south basin along Roberts Road). You may walk to the more eastern basins, even to the slough along Timberlake Rd. Bobcats, venomous snakes, alligators, bears, wild pigs, and coyotes are seen occasionally, but sand burs are the most frequent annoyance (rubber shoes or boots help). Stay away from all buildings and equipment. Be courteous to the employees, many of whom wave when passing. Once in a while, they may have a question or even report a sighting. Also known as the Wright Landfill or the "Okaloosa Dump". Open weekdays 7am to 330pm, Saturdays 7am to noon. Gated - Call before visiting. From the West (Destin), Go east on Hwy 98 to Sandestin Blvd traffic light, watch for a water tower with South Walton written on it. Take the 3rd turning after the water tower. The entrance road has no name but there is a sign ‘Coffeen Nature Preserve’. Take the first right turn after the gate to the office. A memorial cemetery with tours open to the public (call 850-859-2141) Thursday to Sunday 9am to 4pm. The Lake Barbara Boardwalk overlooks water where lily pads are in bloom from midsummer through the fall. 30.859758, -86.113204 private 297 Railroad AVE DeFuniak Springs 30.859758 -86.113204 Glendale N.P. 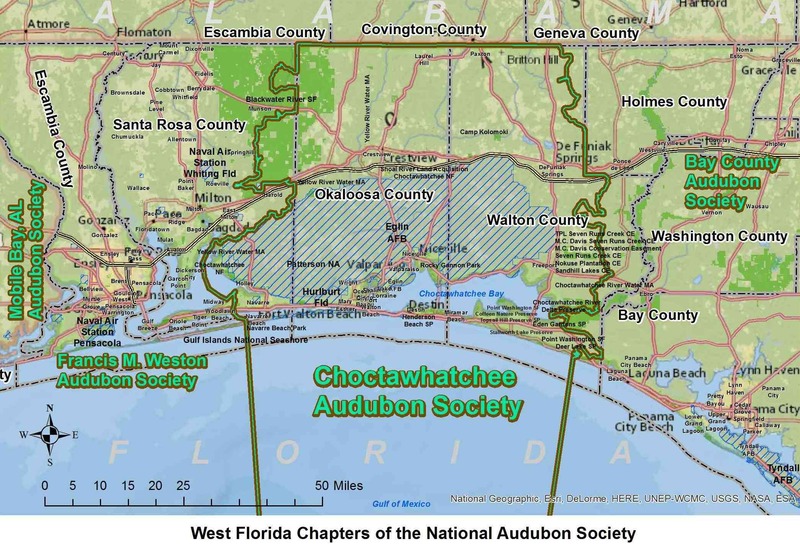 See also the Florida Birding Map of more great places compiled by Elliot Schunke.